The basis and the core of the modular component system is the innovative SI-MODULAR® stick-in structure system made of wood. The structure frame builds the basic system of the modular component construction. It includes all necessary components, e.g. pillars, sill plates, floor girders and rafters, which are required for the assembly. All the materials for the assembly and fixing on the base plate produced by the customer are included in the structural frame package, as well as the structural analysis and the assembly instruction. All types of buildings can be stuck together by hand. You only need a hammer as a tool. The individual components are made of Kerto laminated veneer lumber and FJI beams (I-joist). 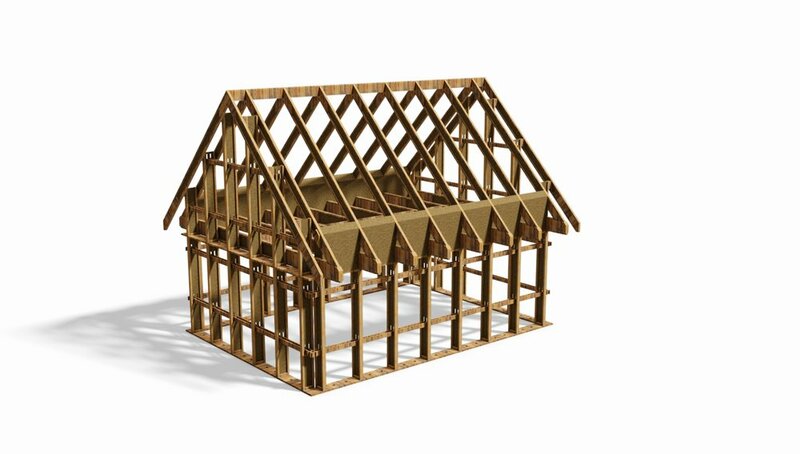 Due to their special construction, the I-joists are specifically material-saving but still very load-bearing. They additionally reduce the heat bridges with the small cross-section and lead to a lower energy consumption. The width is fixed and is always 5.0 m inside (5.70 m outside). The length of the building can be freely selected in steps of one meter. The number behind the dot indicates the number of axes (in meters). The basic kit of type A1 has a dimension of 5 x 5 meters. It includes the ground floor and the top floor. The area is therefore about 50 square meters minus roof droops. Each additional axle extends the basic kit by 1 x 5 meters and 10 square meters (ground floor + top floor). The structural frame of type A1 consists of pillars, floor girder and rafters made of FJI-beams, as well as sill plates and frames made of laminated veneer lumber, floor formworks on the basic plate are made of ESB panels and roof formworks of DWD panels. Incl. all the materials for the assembly and the fastener on the base plate produced by the customer. A type structural analysis and a detailed assembly instruction are included in the price. The basic kit of type B1 has a dimension of 5 x 5 meters. It has only one story and the area is 25 square meters. Each additional axle extends the basic kit by 1 x 5 meters and 5 square meters. The basic kit of type C1 has a dimension of 5 x 5 meters. It has only one story and the area is 25 square meters. 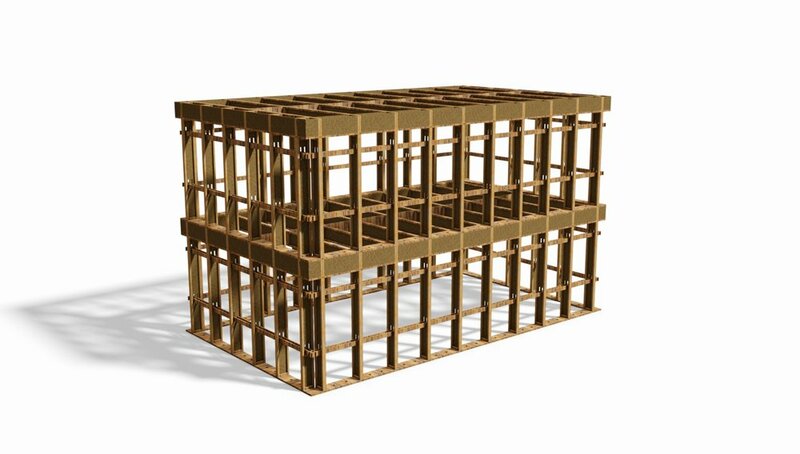 The structural frame of type C1 consists of pillars and floor girders made of FJI-beams, as well as sill plates and frames made of laminated veneer lumber. The roof panels on the floor blanket are made of ESB panels. The basic kit of type C2 has a dimensions of 5 x 5 meters. It includes the ground floor and the top floor. The area is therefore about 50 square meters. Each additional axle extends the basic kit by 1 meters in the length and 10 square meters in the area (5 m² on the ground floor + 5 m² on the top floor). The structural frame of type C2 consists of pillars and floor girders made of FJI-beams, as well as sill plates and frames made of laminated veneer lumber. The floor panels and roof panels on the floor blanket are made of ESB panels.